Horses In Art Magazine Blog – The world of horses and art brought together! The world of horses and art brought together! Back issues are still available! Back issues now available starting at only $7 includes shipping! Visit http://www.horsesinart.com to order! 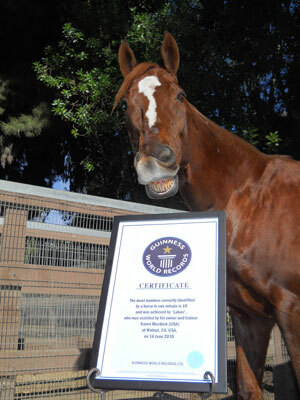 Throughout history the horse has been a popular subject in Asian art. Often a symbol of strength, power and speed the equine was highly regarded and used to represent the progression and achievements of society. 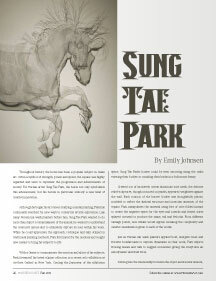 For Korean artist Sung Tae Park, the horse not only symbolizes this advancement, but his horses in particular embody a new kind of creative innovation. And don’t forget to look for the new issue coming soon!!!!! Blue Springs, MO — November 17th, 2011— Calling all Artists… 12 years and under! 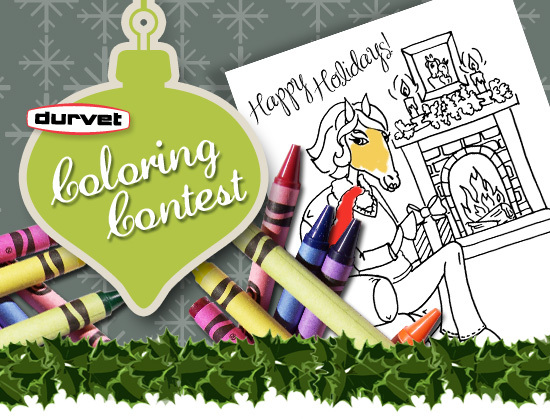 This holiday season Durvet will be holding their first annual Holiday Coloring Contest for Kids! We are asking kids ages 1 through 12 to color the Holiday Coloring Page provided on our website. The grand prize winner will receive a Durvet Gift Basket and the two finalists will receive an Aloe Advantage Grooming Pack. The winner and finalists will be announced January 16th, 2012. Coco Chanel said of her childhood: “The only happy times were those I spent on horseback. I didn’t know people: I knew horses.” Her signature style incorporated jodhpurs and riding jackets into everyday sports wear and for more that a century, fashion has been the better for its equestrian influences. 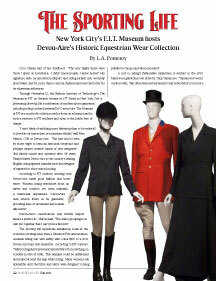 Through November 12, the Fashion Institue of Technology’s The Museum at FIT on Seventh Avenue at 27th Street in New York City is presenting “Sporting Life”, a celebration of modern sports garments, including riding clothes presented by Devon-Aire. The Museum at FIT is a non-profit collection with a focus on education and its both a resource to FIT students and open to the public free of charge. Known for a strong work ethic, a sense of moral responsibility and the ability to navigate vast and treacherous terrain, cowboys are often revered in popular culture. As one with their horse, the all-American hero leads a life of solitude traversing the land and helping those in need. 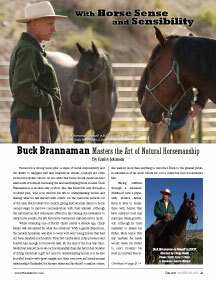 Buck Brannaman is a modern day cowboy who has found his way through a troubled past, who now devotes his life to understanding horses and sharing what he has learned with others. On the road nine months out of the year, Buck travels the country giving instructional clinics to horse owners eager to improve communication with their animals. Although the information and techniques offered in his training are invaluable to many horse people, the life lessons he teaches are inspirations for us all. and European magpies have successfully passed this test. an accessible but hidden part of his body (to rule out tactile involvement). mirror, while ignoring the control spot. rank anywhere from fifth to ninth in intelligence comparisons between species. interactive element, intermediary voice prompts and reinforcement variations. that he believed his reflection to be an interloper.